"The new battery can quickly store energy produced by locomotives and automobiles. This speedy and highly effective recharge characteristic of the battery will support CO2 reduction, as the battery can save and re-use energy that was simply wasted before." One burning question that still remains. What are the by products? - One shortcoming of the fuel cell is it's voracious appetite for oxygen. Wholesale applications of the these could theoretically deplete significant amounts form our atmosphere! TOKYO -- Toshiba Corporation today announced a breakthrough in lithium-ion batteries that makes long recharge times a thing of the past. The company's new battery can recharge 80% of a battery's energy capacity in only one minute, approximately 60 times faster than the typical lithium-ion batteries in wide use today, and combines this fast recharge time with performance-boosting improvements in energy density. The new battery fuses Toshiba's latest advances in nano-material technology for the electric devices sector with cumulative know-how in manufacturing lithium-ion battery cells. A breakthrough technology applied to the negative electrode uses new nano-particles to prevent organic liquid electrolytes from reducing during battery recharging. The nano-particles quickly absorb and store vast amount of lithium ions, without causing any deterioration in the electrode. The excellent recharging characteristics of new battery are not its only performance advantages. The battery has a long life cycle, losing only 1% of capacity after 1,000 cycles of discharging and recharging, and can operate at very low temperatures. At minus 40 degrees centigrade, the battery can discharge 80% of its capacity, against 100% in an ambient temperature of 25 degree centigrade). 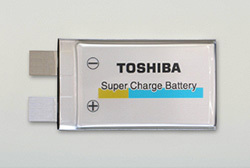 Toshiba will bring the new rechargeable battery to commercial products in 2006. Initial applications will be in the automotive and industrial sectors, where the slim, small-sized battery will deliver large amounts of energy while requiring only a minute to recharge. For example, the battery's advantages in size, weight and safety highly suit it for a role as an alternative power source for hybrid electric vehicles. Toshiba expects that the high energy density and excellent recharge performance of the new battery will assure its successful application as a new energy solution in many areas of society. The thin battery recharges to 80% of full capacity in only a minute. Total recharge takes only a few more minutes. A prototype of new battery (a laminated lithium ion battery with 600mAh capacity) was discharged and fully recharged 1,000 times at a temperature of 25 degrees centigrade and lost only 1% of capacity during the test. The new battery operates well in extremes of temperature. It discharges 80% of its capacity at minus 40 degrees centigrade, against 100% at an ambient temperature of 25 degrees centigrade, and loses only 5% of capacity at temperatures as high as 45 degrees centigrade after 1,000 cycles. These characteristics assure the wide applicability of the battery as a power source for products as diverse as hybrid vehicles and mobile phones. 600mAh that charges to 80% in 1 minute ?!! 80% of 600mAh = 480mAh. Assuming Battery Voltage = 3V, Total Energy required = 3*0.48*60*60 = 5184J. Charging time = 60s, Assuming Charging Voltage 12V, Charging Current = 5184/12/60 = 7.2Amps. That's pretty high current!